RETRO KIMMER'S BLOG: BON JOVI: WORK NEW COFFEE TABLE BOOK FOR CHRISTMAS! BON JOVI: WORK NEW COFFEE TABLE BOOK FOR CHRISTMAS! 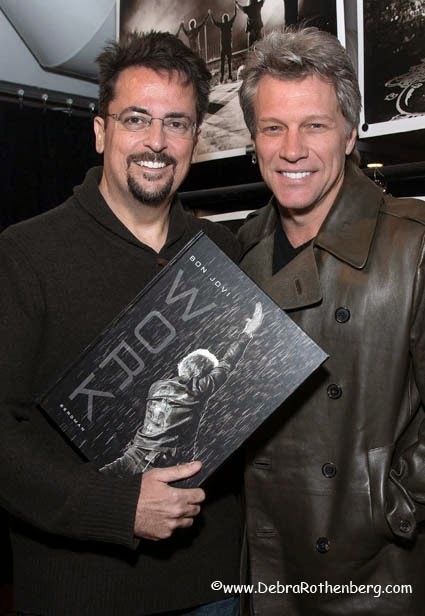 NEW YORK (Nov. 24, 2014) – Responding to popular demand in time for the holidays, BON JOVI: WORK, the extraordinary coffee table book released worldwide this fall that offers a rare, behind-the-scenes look at the top touring band in the world by its official tour photographer, David Bergman, is now available on Amazon after being previously being available only at the official Bon Jovi website. The five-pound, oversized, 210-page hardcover book becomes more accessible through Amazon just as Parade Magazine made it the No. 1 “Rock ‘n’ Roll Read” for the holiday season, calling BON JOVI: WORK a “dazzling” experience. Click here to order BON JOVI: WORK (Press Syndication Group, 210 pp., $59.95) at Amazon. The book remains available at www.bonjovi.com/work as well. Jon Bon Jovi surprised the crowd – and Bergman – at the photographer’s recent New York City book signing and gallery event, hosted by Adorama and sponsored by Canon, by making a casual appearance to publicly show his support for the photographer and the project. They were interviewed together there in an exclusive for EXTRA TV.